Red is the main road. Yellow is the train tracks. Blue is the towns. Have you guys ever found the map to be rather small in its current state? That the difficulty was static regardless of which town you were in? An overarching story that most of you will never hear all of? Or maybe none of that and are just seeing a failed pitch? This map will be quadruple (I don't even know anymore) the size of the original map. A story will be accompanying the map that will begin a few minutes after the game starts. As I said its planned to be four times the size of the original map. So bear with me on trying to get it finished, because there is no one else who wants to finish this more than I do. The map is currently at 77 cells by 42 cells and about a third of that is covered in water. You're probably wondering why so big. Well a large reason is to cater to several groups and to make this one of the maps for multiplayer. Now right now yes the map might be a bit too large to traverse by foot but I'm planning around vehicles so that my map doesn't gather dust once they're released. This map is entirely based off of a map I made. The idea was to base it off my writings and I will be using some portions in there. However the narrative will always be changing and will be revolving around many of the POI's I'll be adding in; one of which is already added in the map. There are several landmasses with the three being connected by bridges, for now. There are many more islands that are not connected and will be hard to reach but will be populated nonetheless. One thing I wanted to do was make players feel challenged. By this I don't mean create artificial challenges that the player should aim for but rather create rewards for players who are willing to go the extra mile to get valuable loot in dangerous areas. The story will revolve around going to key places over time until you reach the end which will, hopefully, give you some satisfaction and a cool place to call home. You like the many before you are people that have found this new land in the midst of disaster. Survival is your goal in this new world where an unknown force seems keen on pressing your luck. Zombies won't be making your life any easier so you better reach the Red Fortress quick. With all that wrapped up I'd like to thank you all for taking the time to read what I have. The overall scope of the map is large and i've seen mods of a higher caliber and smaller scopes fail and come to a standstill so lets hope that does not happen and that I can make the same amount of progress regularly. Any questions or suggestions do send them my way whether by posting in this thread, a PM or add me on steam. Alpha 2: Bridgewater and 3 Poi's are added. Major Overhaul 1: Map has grown significantly. Blackbeard for his great tutorial on how to get started. if you use my map in any map packs or content packs please ask first! Likely I will not say no but I'll probably discourage you from using it as this map is intended to be standalone. Any updates I make could cause problems for your map pack because of the sheer size of the map that I am aiming for and I don't want people hounding me for problems that could be caused by your map pack. I can't really estimate the size of the map because there is no reference, but if it is really huge what about this: make one town at the coast the spawntown where people can group up and start their expeditions from? Other than that, did you draw the land yourself or did you use some kinda generator for landscapes cause it looks extremely awesome like jaw dropping, this map is gonna be something special great work! The dimensions are 15k by 10.2k. As for a "spawntown" I could definitely create something like that I would just have to figure out where along the coast and which town to transform into it. 10k by 15k was correct off the image I have posted but thanks to your post i will be saved some headache later down the road. Now the map is 9.9k by 15k. As for being able to work on it I will be able to get it done so long as i have the motivation and time to do it. I've edited my main post with the map I based this map off of and that one started getting laggy due to already being above a 15g file. To get the other details in with ease i simply saved that file as jpeg and then opened it and continued working from there. So what I might suggest for you to do with gimp would be, get one layer done save it as a jpeg and then continue your next layer on said jpeg. The lag wont be too great if at all because gimp wont be processing too many layers. The original map was partially hand drawn and partially generated (more generated than hand drawn though). For the land masses I used a cloud filter and then threshold adjustment and just took out land pieces I didn't want and made water ways where I wanted them. 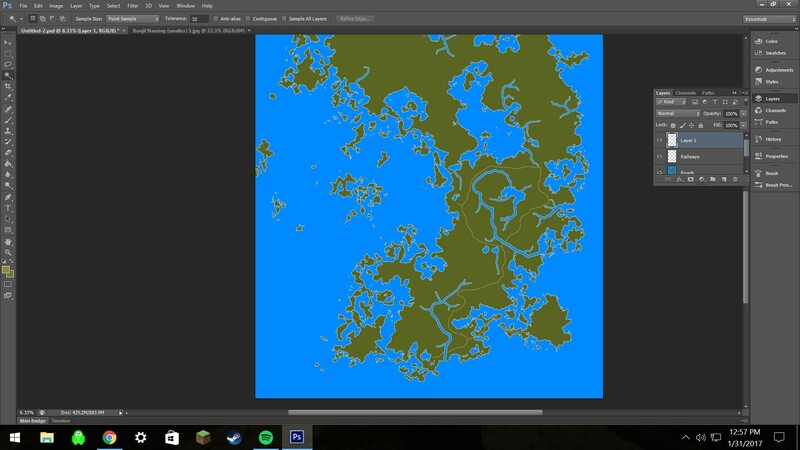 I can link you a tutorial on how to use gimp for landmasses and waterways and then you can use the PZ palette from there. Hopefully later today i can show you all an update of the rail ways and where i intend on them to cross through and then soon after the roads. So I've just about finished the railway paths. As Lumbo and Zoeyflower suggested, the very beginning of the railway in the bottom left will have a major city and the few settlements outside of it will be the "easier" spawnpoints. You may also notice that the rail ways only go so far north before the north is just blank; This is intentional as the north will be harsher, whether it'd be the harsh environment (lack of sources of infinite water and food) or a higher concentration of zombies along with the roads having a larger amount of zombies than those in the south. Again all suggestions and questions are welcome. 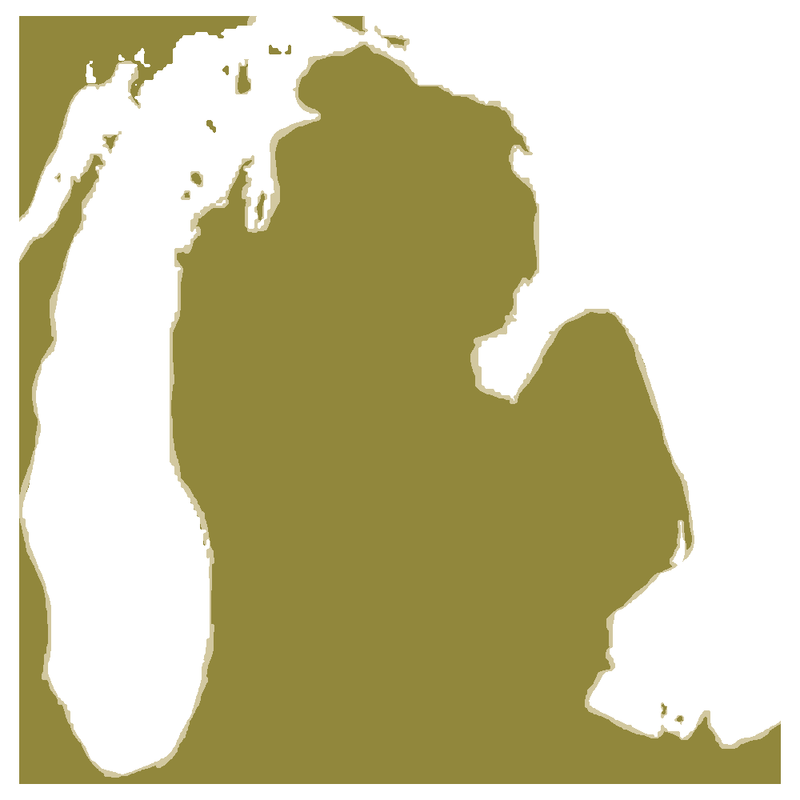 the original michigan was about 8 times smaller than this and with some additional hand drawn smoothing it looks pretty good and game ready + fits enough space for the game. Dont mean to promote or anything, just incase you see something that youd love to put into your map but its too small you can resize it using this technique and apply pz's color schemes into it. Not really sure what blur you're talking about. If its the one in the images where things look blurry as you zoom in then thats just cause of imgurs low quality. However if its a different one do let me know so I can fix it. I tried it and it didnt look right to me so I'm back to what I originally planned. Thank you for the suggestion though. First off this is one of the two "starter" towns, but the only one finished. Dont mind the road connections at the bottom, have to fix it. Next is an image that shows off the scale a bit better. Been a while since I played so I doubt that it'll take 2-3 days to get from one city to the next based off these dimensions. Maybe if it was about twice the size that 'd be the case but we'll see once i get it into the editor. 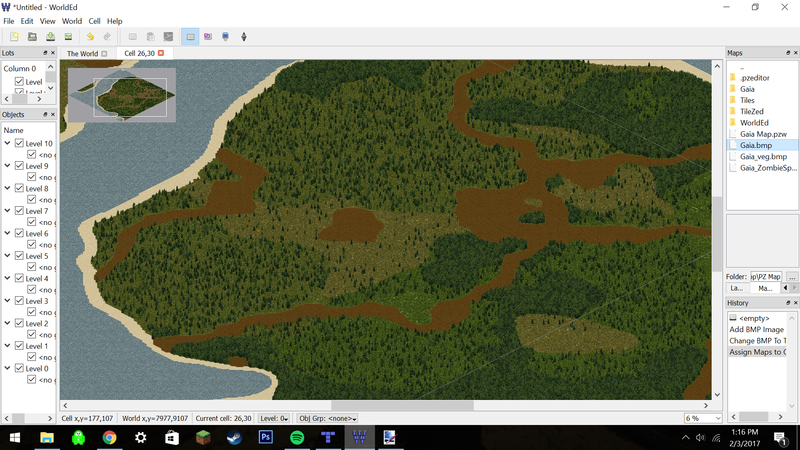 Next here is a look at the terrain, ponds/lakes, railways and roads as whole. I made it horizontal to get the whole image in. 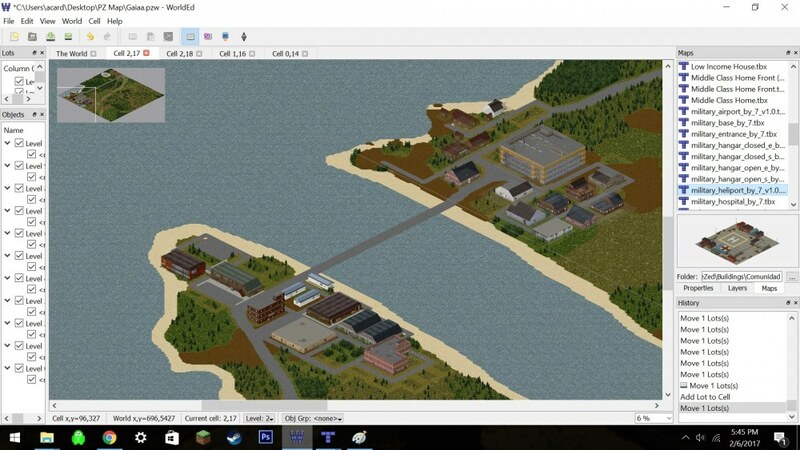 This next image is the same as the last except for showing off the planned locations of towns, cities and camps. Cities are red, Towns are yellow and Camps are blue. 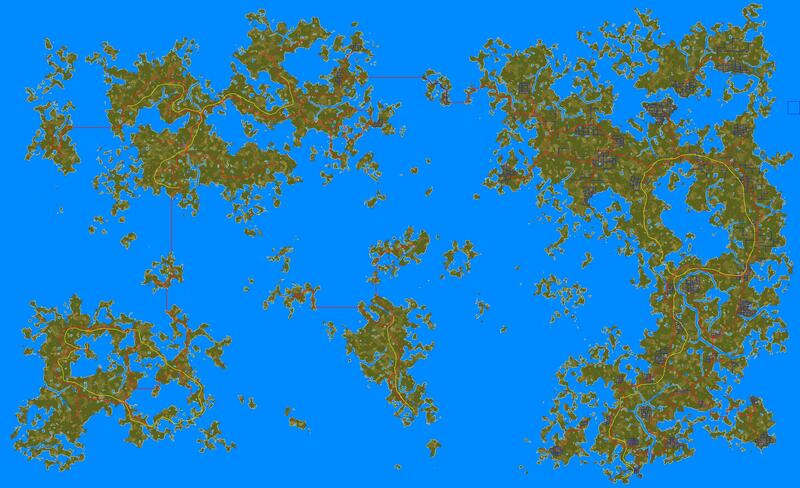 Towns will average out to 180x180, cities to no more than 400x400, and camps aren't going to have roads but will have dirt paths leading to them and will only be anywhere from 1 -10 structures. 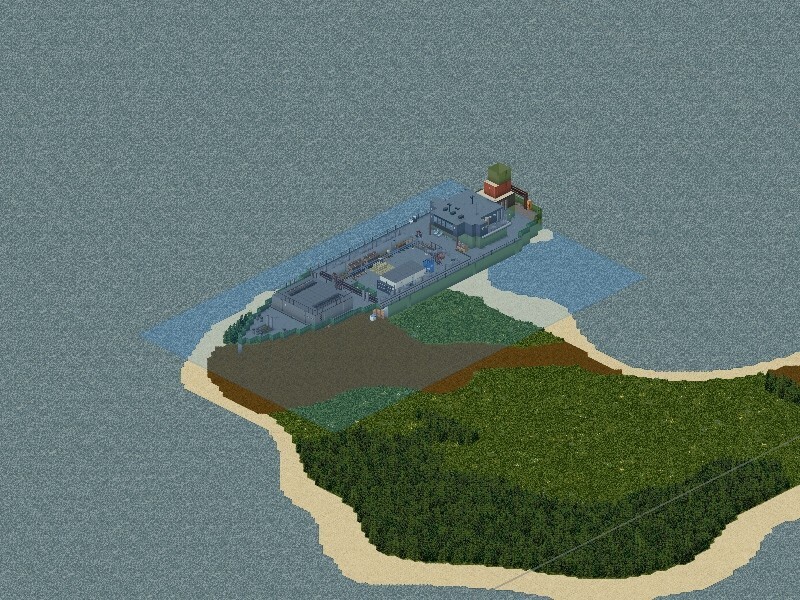 I've also hidden the locations of POI's which will be things like bunkers, labs, cabins, outposts and old forts along with some other interesting things that wont have much use at the moment. So overall i've added a lot of the busy work (most of which is randomly generated) and I'm now focusing in on the ground work, literally. So the next update will probably have the town layouts complete and quite possibly start on the veg map (which will likely also be randomly generated). Quite the late update that I have but an update no less. Something for everyone to remember, save frequently and have up to date backups. I forgot that last night and lost about 8 hours of work along with the rest of the psb file later corrupting. Not fun. One thing that i did advance on that I had not shown you yet was the towns. 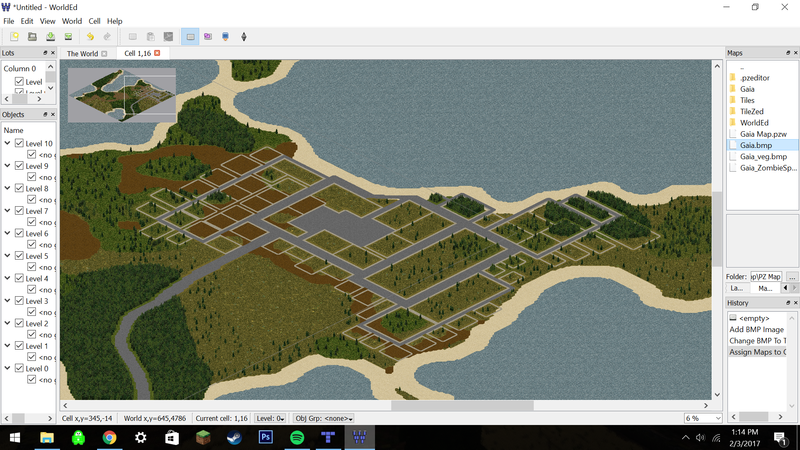 They have all gotten their main road layouts already and now I just need to mark the building layouts and minor roads. Another thing is there will be several farms (not all will have food to harvest) for players to hole up in for the night when travelling. You might be thinking it'll make players stay there but not necessarily when other players are a threat and I add large clumps of zombies to the region. The yellow is meant to allow you to see the overall layout of the road and main roads of the towns. A major point i'd like to make early on is that the main road is by no means the "most optimal route" considering that the roads will likely be infested with zombies but will have their fair share of loot in moderation. Thus travelling along the dirt paths is probably better, assuming you go along the right path and dont hit any large zombie groups there. 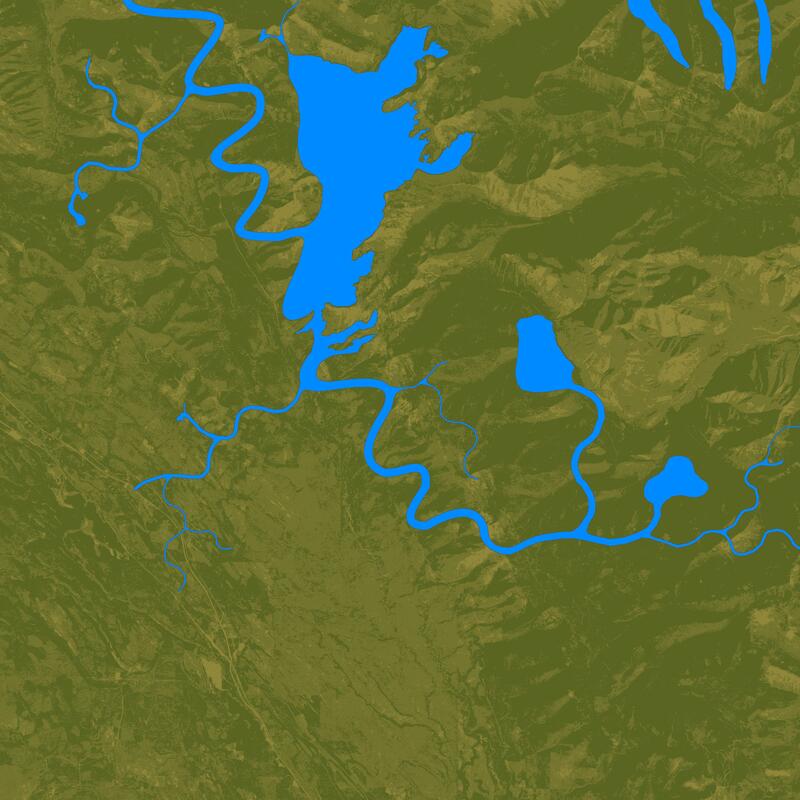 A portion of the map that i'd like to bring attention to is in the southeastern portion of the map. There's a rather large city there which I plan on filling with tall buildings for some fun with verticality (I don't think this is a word actually). There will be a train system there (just more buildings) that will be about 2 stories high which you'll be able to maneuver the dangerous city through, assuming you can make it up there before dying. This will be the more modern of the towns and will likely have access to all sorts of amenities for your pleasure, or failed attempts to retrieve. and thats about it for the map, i'll likely make some map items with the help of the cartozed to show where some secret locations are and also outlying camps, which again will have some of the tools to start building your own towns. Another thing is I'll probably also learn how to use the WordZed so that you can find out locations through there as well along with a few stories for the players to unravel. Which reminds me, i wonder where the most optimal locations will be for the ham radios so that different groups can stay in contact. 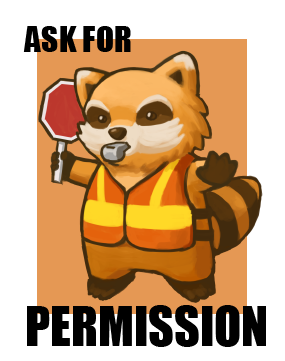 As always, leave a post with any suggestions or questions you have. If you have some good ideas for hidden locations post them here too. I've gotten the map into WorldZed without an issue and am now in the process of populating the world with buildings some my own and others from the many skilled creators in the forum. If you have a cool building you've been working on and would like to see it shine in the map throw it my way and I'll fit it in somewhere. This first image is of Anabasis. It will be the starter town of the map for players to meet up with one another. It may be the ideal place for player based communities as it is at the start of the Main Road and Railway. It will likely be the first done and will have a school, police station, motel and many storefronts. Bridgewater is the next town and is not that far from Anabasis (going to check in game shortly how long it'd take to run from one to the other). As the name suggests there is a bridge and it connects both parts of town. this is going to be slightly more of a warehouse and industrial type place. 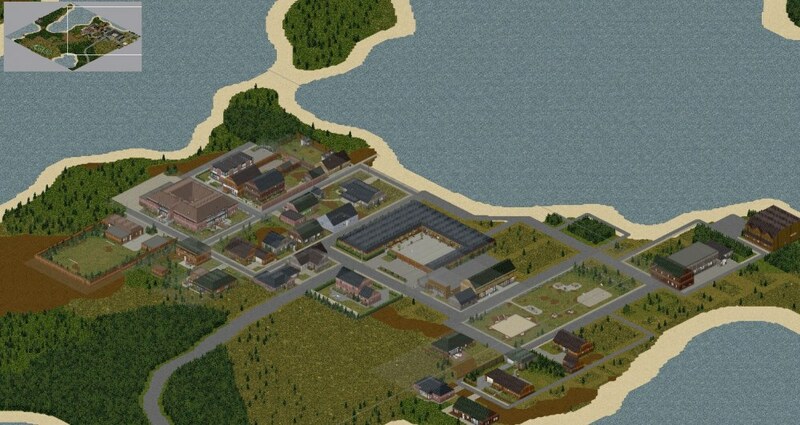 There isnt going to be a school but there will be a doctors office along with the mentioned warehouses and maybe a power plant or something like it where the population of the two towns usually work. Finally im throwing in an image for one of the camp locations just so you all have an idea of what the size of the room will be for you all to create your own communities on larger servers. The map will definitely be taking a while to populate with buildings and spawnpoints. As always, suggestions, questions and comments are always welcome. Have you considered a more structured approach to buildings? Perhaps create a google sheet for each main town listing building type, approximate location, and size. Maybe also more strategic concerns such as number of containers, floors, and entrances. For the southern land bridge I had something in mind already. But its a bit spoilerish in the story I want to create with Wordzed. Let's just say it's a rural community turned military checkpoint. Updates are going to be less frequent over the next week as I'm currently fixing up buildings by replacing or deleting items with missing textures and also making the buildings fit in the current constraints. Of the towns. One other thing of mention is that camps are not going to be really camps in the way I pictured it but rather small collections of trailers or cabins. If you plan on building at them you'll need to bring up your own tools. Many may need to be cleared of zombies and a few will be there for just a night's rest as the surrounding woods may still have large amounts of zombies. Small update on progress, I've started filling in Anabasis with bot semi-"cleaned" buildings and fully "cleaned" buildings. By cleaned I mean that I've gone into the file and removed the red question marks and made the buildings fit what I need. This will then allow me to release a working version of the map and then go back and make changes as necessary and continue the cleaning. On another note I have here a POI. My question to you all is whether or not to make it a POI or if I should make a spawnpoint for players nearby. In its current location zombies are not that big of a threat and could very well make a nice base out of it. However the downside to a POI is many people may never come across (though no one will probably ever come across everything in-game). As a spawnpoint the downside is it'd make the beginning a bit to easy and also might cause spawn camping from griefers. One thing that will be happening though regardless of which way we choose is that it will tie into the lore. Its actually going to be one of several pieces in the beginning so you better hope you have a radio early on. A playable Alpha has been released. Check out the main post for the files and instructions. For those of you who have patiently been following my progress and supporting me through this I'd like to show you Alpha 1. The current state of the map, which is just Anabasis currently, is good enough for a test run by you all. Any bugs, glitches or things you think are odd send my way. A few known things are sinks on the floors of bathrooms, black tiles on some sidewalks and seeds spawning a lot (not sure if that's my fault yet). There are three POI's. there are spawn points near them but in which direction of them you'll have to find out on your own. The story is still not implemented so they're actually just points of interests you may want to check out. Another thing is that you may want to turn up the zombie count so that it's a good pace. Aside from that and as always send your suggestions and questions my way and ill try to get back to you as quickly as I can. Haha thank you. I'm trying to get the bulk of the building placement done as quickly as possible so that I can have the Western area before reaching the "Land bridges" in a playable state and ready for testing. The eastern portion however is going to take a bit as I have to either find someone that can make multistory buildings and houses that would fit a metropolitan cityscape and also another pack of buildings for a university town. On a side note, later today I plan on releasing the whole map (unfinished of course) for everyone to freely explore the landscape. full on game play is not suggested as those files will be regularly updated. I'm hoping it will contain a second town/city but no promises there. This update brings out 3 more POI's along with the town of Bridgewater! Bridgewater is a tiny town that relied heavily on the nearby factory for work. However it closed up shop and now the people o Bridgewater have fallen into desperation and take up whatever jobs they can in the city. Bridgewater, where hopes and dreams quickly meet their end! The three new POI's are two military locations and the factory. The two military locations are probably going to be places you'll want to check out early on in order to get those nice radio's you'll want to hear the story. and remember, get there early or you'll miss something! Other things of note, there is currently only one spawn and thats due to me not liking all the ones i had so i just made one for the time being. it'll be at the top left hand side of town along the beach. Anabasis also got a bit of cleaning. There shouldnt be blacktiles anymore and some buildings like the grocery got walls in areas it was missing them. The files will be in the Topic post. As usual all comments, recommendations and questions are welcome. As for the steam release, I've decided on not releasing anything until this weekend as it'll allow me to finish up a few more towns for larger use. in select map screen image is too big, I recommend a 256x256 size so it doesn't messing things up with map screen. I figured you know about this as you have a place holder. ship, good idea, took me a min to figure out what it was. lots of zombies. even in the woods, trails. 1. Yeah, ill probably get that done tomorrow and just resize the Anabasis image and reupload with that small fix. 2. The ship will eventually be a spawnpoint but for now its just the one. As for discovering everything did you find the factory and the watch tower? 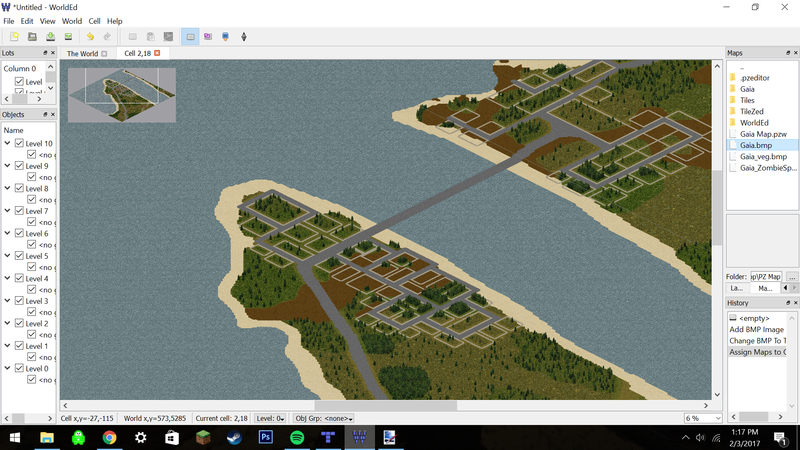 I've finished placement for two more towns and just need to fix them up to be able to be released. I'm also starting work on my own buildings so that I can make the towns a little more cohesive. I have also started making elevated trail rails for the metropolitan cities in the east. I probably won't be releasing updates as quickly now that I'm going this route as I end up spending about 30-60 mins on each building and I expect it to be even longer in more detailed buildings. Right now I will probably fix up some of the buildings I've already got placed so that they're less repetitive and makes every town feel a little more unique. I'm liking this map so far! Just found it, if you've used any of my buildings, delete them for now, not because i don't want you using them. It's because i did dun fucked up when i went ahead and did the internal names for the rooms. I'm in the middle of fixing this with all my buildings and the ones with dropbox links are the only ones useable. If you didn't use any of my buildings well then lol, this is pointless. In any case, I like the work you doing with this and i'm exited to see more of your progress! Good luck! Thanks for the heads up! I'll look through to make sure that they're not in there for the steam release. And thank you! Progress is probably going to stagnate a little over the next week or two while I create buildings.